Characterized by their shape resembling pointed fingers and their horizontal striations, Lemurian Seed Crystals remind us that we came through Lemuria. This was an ancient time upon the Earth preceding Atlantis when we lived in harmony, love and peace. At first, we were not fully densified into form and the presence of these crystals reminds us that we were, in fact, on the Earth but not from the Earth. We were seeded crystalline beings still in communication with the Divine. They have been unearthed for us at this time to help us realize our return to our crystalline form through our ascension on the planet. 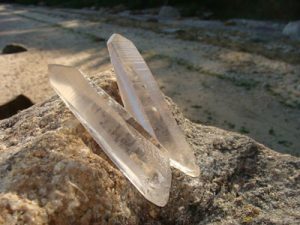 Lemurian Seed Crystals and their laser-like power were used in healing and for focusing energies, not only to the physical body but to crystalline structures of all kinds. In fact these crystals may be used for psychic surgery and empowerment, protection and to bring you to a heightened level of consciousness. They help increase your psychic awareness. They connect us to those beings of light, the Christed Ones, who are assisting us at this time. Their brilliance and transparency help us to release our negative aspects of being and to harness their energies to assist our growth and evolution. Upon close inspection, you will notice their unique horizontal striations etched into the quartz of varying levels of clarity and hue. Some may have raised or etched triangles that offer us an opportunity to access Lemurian programs left us from Lemuria. However, they all assist our reaching the fullness of who we are on another plane. I refer to the spiritual plane where we may access the energies images not only of our higher self but also of those beings who await their re-emergence onto Mother Earth, i.e. the Telosians, the ones living beneath Mt. Shasta and Master Adama, their High Priest. These underground beings are a seed remnant from Lemurian times who, like the Seed Crystals, connect us to “we” consciousness and Unconditional Love. These crystals point us to the higher realms and to a way of being far beyond human three-dimensional existence. They remind us how we were seeded onto Mother Earth, carrying our initial intention into our positioning upon the Earth. It is to these high frequencies of divine love we are returning at this time of the rebirth of Mother Earth within the Universe. All is in divine timing. Their coming to light now is no accident. Thus your presence upon the Earth can be greatly enhanced by the use of these seed crystals. In meditation you may remember you proceeded from the stars, coming to the planet at that time. If you will allow, ancient wisdom is available to us through these crystals. My personal use of Lemurian Seed Crystals has been to create sacred space, to cut away old energies, to clear and clean the aura, cord cutting and to use them as an extension of my own energy. These crystals can help us cut through all the clutter and cloudiness that lies between you and your crystalline heritage as a being of light. We do not point these crystalline fingers at others, but rather we turn the energies inward within our own being, encircling our own energies from head to toe, clearing out the old accumulated patterns and what no longer serves. These powerful crystals are here to amplify the raising of our vibration and our connection to the Divine. As you turn inward, remember it is to Unconditional and Universal Love and to the Divine that you shall return. Trust in the crystal’s ability to point you in the right direction. Allow a Lemurian Seed Crystal to enhance your journey to discover your own Divinity and to reconnect you to your heritage as a crystalline being of light.